Day 8, and what a day it has been. Up at 5 for a special nanny assignment. N.s mom was at a birth and needed some early morning care. Scrambled eggs and veggies at 7:15. The kids had gluten free French toast too. And then a nice long nap when the kids slept. I think I may be fighting off whatever cold they’ve been having too. 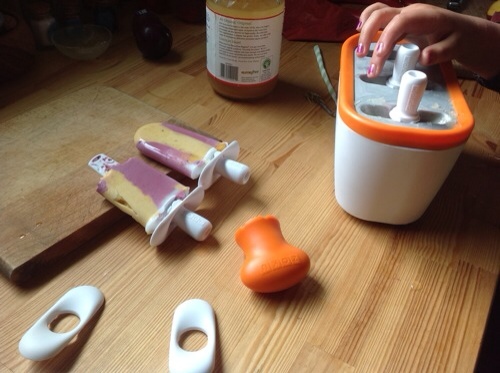 5:00 homemade Popsicles of yogurt, fruit, coconut milk. Yum! I love our new Popsicle freezer. The Zoku quick pop maker. Freeze it overnight and then make popsicles in minutes. Include fresh fruit and stripes, whatever you like. We’ve made several batches already today. Rounded out the day by watching a Garfield movie with our neighbor. Good to do something silly rather than blogging a lot more. 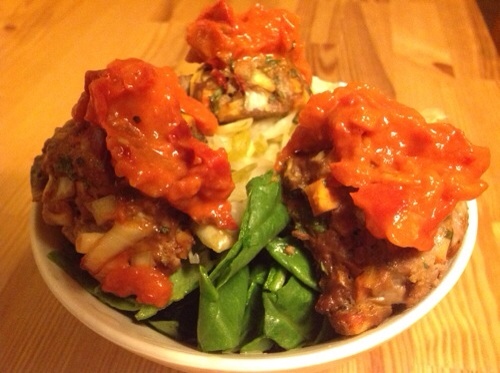 9:00 last 1 1/2 WODs on a bed of spinach and kraut with more sauce on top. My favorite part about blogging my food so far? Is how much prettier I make it look when I’m going to take its picture for you.